In the coming weeks, the airwaves will be filled with salutes to the notables who died in 2015, but for me, one looms largest -- Joe Franklin. He died last January at age 88. And yet, for a man who embodied the very history of television, his death seemed underreported. Indeed, he was omitted from the “In Memoriam” segment they showed during the Emmy Awards last September. Can you believe it? They produced a wrap-up of TV personalities we lost in the year between the Emmy Awards and they didn’t include a guy who had worked on TV since the dawn of the Television Age and was still hosting a nightly talk show in the 1990s. With all due respect to the friends and relatives of many of the writers, producers, composers and other such types they did salute, the segment could have done without most of them. But Joe Franklin? He was one in a million. I knew him for 25 years. I first met him in 1989 when I was a young reporter writing for one of the TV trade pubs and I spent two raucous days interviewing him and soaking up the atmosphere of his office in a 100 year-old brick building at 42nd Street and Broadway. Joe’s office was famous for its clutter. It’s not an exaggeration to say that its contents were piled floor-to-ceiling because they really were. These great stacks of magazines, newspapers, 8x10s, film cans and heaven knew what else really did teeter in such a way that you felt they would fall on you at any moment -- particularly because there was so much activity going on around them (in the tiny space that was left for human occupancy). Among other things, he had a black dial table phone that rang constantly, and Joe would answer it and say pretty much the same thing to everyone who called -- some variation on “Great to hear from you. Call me back at 5 o’clock and I’ll have good news for you.” He admitted to me that he almost never had the good news for them that he promised, nor did many of them call back at 5 o’clock either. Incredibly, when Joe and the other tenants of that old building were forced to leave so it could be torn down, Joe established a new office -- in a building on the southwest corner of Eighth Avenue and 43rd Street -- with the very same clutter. It was as if they had somehow managed to move the piles intact a block west through midtown Manhattan. In the years after I first met him, I would stop in and see him in his office (whichever one it was) every couple of months or so. He seemed to always be there. Pop in at around noon or 12:30? There was Joe. Walk by the building at 8:30 in the evening and wonder what Joe’s up to? There he was. He was rarely alone, even in the years after his nightly talk show ended its run on WWOR/Ch. 9 in June 1993. There were always people around him. One man wanted to sell me lightbulbs he said he’d retrieved late one night from a dumpster in Times Square. He claimed they had been part of the original “zipper,” the lighted sign that beamed news headlines around the building known as One Times Square (it’s the building where the ball drops on New Year’s Eve). 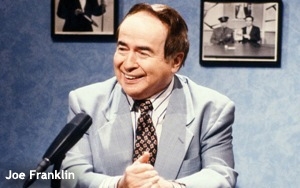 I was a guest on “The Joe Franklin Show” during its final week on the air. My fellow guest was the New York Post’s jazz columnist, Chip Deffaa. Also on the show: Kenny Vance and the Planotones, a doo-wop group that sang an a cappella version of “Life Is But a Dream” that was one of the most sublime performances I have ever witnessed. In 1997, I spent a Saturday night -- actually the wee hours of Sunday morning -- with Joe and his right-hand man and producer, Richie Ornstein, as Joe hosted his overnight radio show, “Joe Franklin’s Memory Lane,” on WOR-AM from the station’s old studios at 40th Street and Broadway. I bailed at 3 or 4 o’clock in the morning, but as I drove home through the nearly deserted Manhattan streets, I listened to Joe as he meandered from subject to subject. He would still be at it until 6 a.m.
And he was still at it just a few weeks before he died. Incredibly, Joe Franklin was still interviewing people for Bloomberg radio -- segments they would air on weekends. I was due to be interviewed myself some time in December of last year, but it was not to be. Joe had taken ill, and a few weeks later, he died. And so, if the Emmys can’t get around to saluting Joe Franklin, then I thought I would. I guess I just did. 6 comments about "Remembering A Legend We Lost In 2015: Joe Franklin". David Reich from Reich Communications, Inc., December 15, 2015 at 1:07 p.m. Yes, Adam, Joe Franklin was a legend and definitely one-of-a-kind. I remember his office at 43rd and 8th. He invited me to stop by to talk about a segment idea. He had to clear a space for me on his couch, and I was afraid the piles of stuff would fall over on me. I glanced at one of the piles while he took one of several calls during our meeting -- 8x10 glossies of who knows who, and press kits, records, tapes, books.... a show biz treasure trove. He was always nice to me in person or on the phone, and yes, I remember him saying so many times, call me back at 5 or 6 or tomorrow. I actually did book a client on his show... once. A nice guy. Thanks for remembering him. ida tarbell from s-t broadcasting, December 15, 2015 at 2:06 p.m. He was a joke. From his comb over transplant to the crowded desk he operated his show from, to the hypetractive speed he motormouthed at when interviewing guests. He was constantly funny because he was continually absurd in every way. The lowbrow show drew guests because it was such a novelty just ot be on his show. I remember George Maharis, long gone from his fame from Route 66, his brief film career a distant memory, coming on the show fairly often. I ran a cable system in Wisconsin that was probably the only one in the state that carried WWOR, KTLA in LA, KTVU in Oakland and, occasionally, WPIX-Tv in NYC. This was at the time when the satellite was new and none of the awful networks that are on cable now, had yet arrived. Those were the days. I haven't even had cable in 23 years. The local indies in the big cities are what got me interested in cable. Not interested anymore. Nicholas Schiavone from Nicholas P. Schiavone, LLC, December 15, 2015 at 10:13 p.m. I think ida missed the point. I think you are onto something good, Adam. People who do not recognize what made Joe so engaging are snobs. TV needs more of the Joe Franklins and less (read: None) of the Howard Sterns. Thank you very much, Adam. A tribute to Joe Franklin is long overdue. Steve Maietta from MaiettaMedia, December 16, 2015 at 4:34 a.m.
Steve Smith from Mediapost, December 18, 2015 at 7:17 a.m. The WOR TV show was integral to my own passion for pop culture and respect for the troupers who hoofed, crooned, astonished and touched us from the stage. Joe had a humbling envy/respect of performers. His hospitality to performers of all stripes was an object lesson for budding media critics like myself that the people we wrote about were putting themselves out there in ways we never would. Ed Papazian from Media Dynamics Inc, December 18, 2015 at 9:34 a.m. I ran into Joe several times and watched his show on WOR-TV periodically way back in the 1970s. I thought that he was very supportive of budding new talent as well as many showbiz vets who were no longer in the limelight. Rest In Peace Joe.